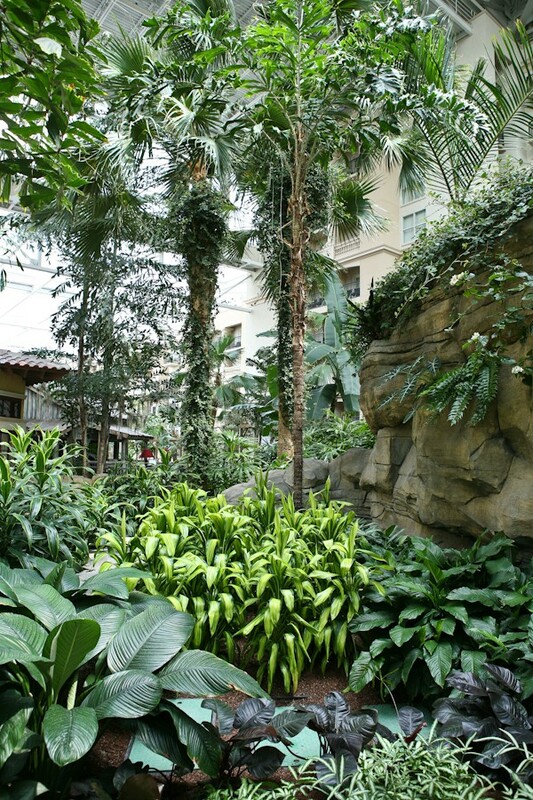 Weekend before last we had an incredible little family vacation right here in Orlando at The Gaylord Palms. 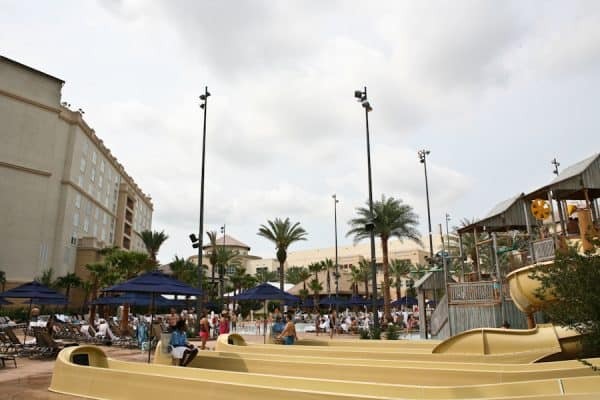 We live on the north side of Orlando, so when we want to go on vacation, but don’t want to travel, we’ll stay at one of the fabulous resorts on the south side of town near Disney or the convention center. After a short 30 minute drive, we arrived at the hotel. The rooms we had were AMAZING. And I’m not just saying that. They were one of the nicest hotel rooms we’ve stayed at. My husband and I had a King suite, which had a full sized dining room table and a living room area. It was huge, luxurious and perfectly clean. 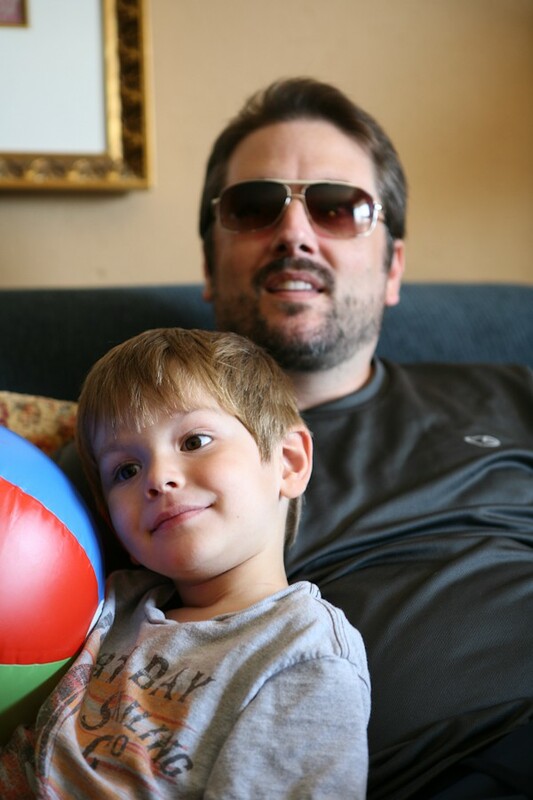 Here’s my son and hubs taking some time to just relax before the pool. Later that night we had a beautiful welcome reception with amazing appetizers and cocktails. Afterwards we all jumped in the pool to wear the kids out so they’d be sleepy. After putting them to bed, we took turns going down and hanging out at the bars on site. We spent some time at the beautiful sushi bar, and a gorgeous new sports bar called Wrecker’s Sports Bar. The bar is amazing and has 50 HDTVs and a two story, 37’ sports screen. We all got to meet some very interesting people from all different walks of life. The next morning, a little hung over, we took the kids to a character Shrek breakfast. The Gaylord Palms has Shrekfeast right now for the kids. It’s a fun-filled weekend perfect for families. My son and his little 2 year old cousin had a blast. My son is on the left, and that’s my brother-in-law trying to encourage him to meet Shrek. Thankfully his little two year-old is still fearless. He loved meeting the whole cast, especially Puss in Boots. He kept calling him “Big Kitty.” My son spent most of the time hiding from the characters under the table, but then he was devastated when they left. After breakfast we headed to the pool. They have an amazingly huge zero-entry swimming pool with a massive screen for movies at night. The day was filled with character entertainment and fun games for kids of all ages. There’s also a pool-side bar, cabanas, and lots of umbrellas if you need a a little shade. 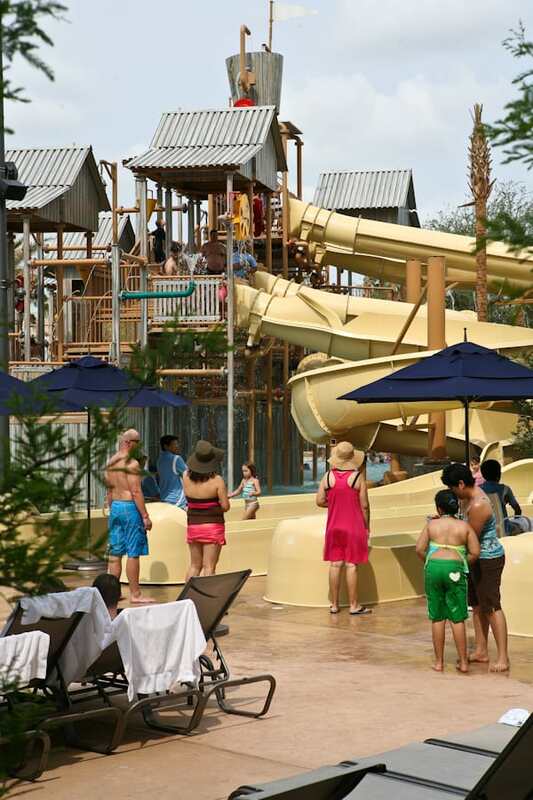 There’s even a huge water playground called Cypress Springs Family Fun Water Park complete with water slides, baby swings, things for toddlers to do and lots of other fun stuff. During the day there was a Madagascar Crack-a-Lackin’ Pool Party that everyone was having fun at. That afternoon we ate at the pool-side bar, the SandBar. Later that night on the huge screen above the pool was the Splash ‘N’ Screen Movie. The kids had so much fun being able to run around and play in the pool while watching one of their favorite movies. On the other side there’s even an adult only swimming pool, the South Beach Pool (and hot tubs), if you want to avoid kids. This area is perfect for couples who need peace and quiet. All these areas are part of a massive $50 million dollar renovation that The Gaylord Palms just completed. They also renovated all the rooms. The Gaylord Palms is situated around a huge atrium. 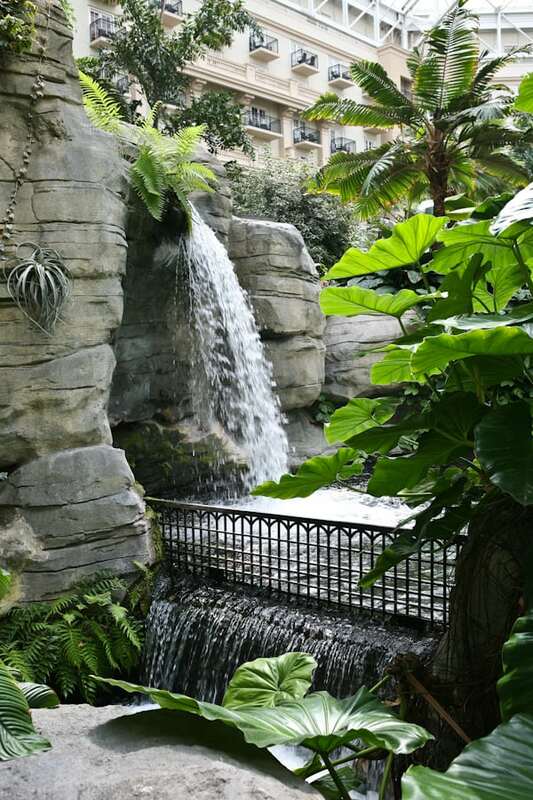 It’s four-and-a-half acres of lush climate-controlled gardens and waterways. There is a ton of plants all so beautiful. And did I mention baby gators! Don’t worry they are securely contained in a habitat. There’s a ton of winding paths. It’s such a gorgeous place to walk around in. Here’s all the guys, posing. There’s also a salt water area with this huge boat. 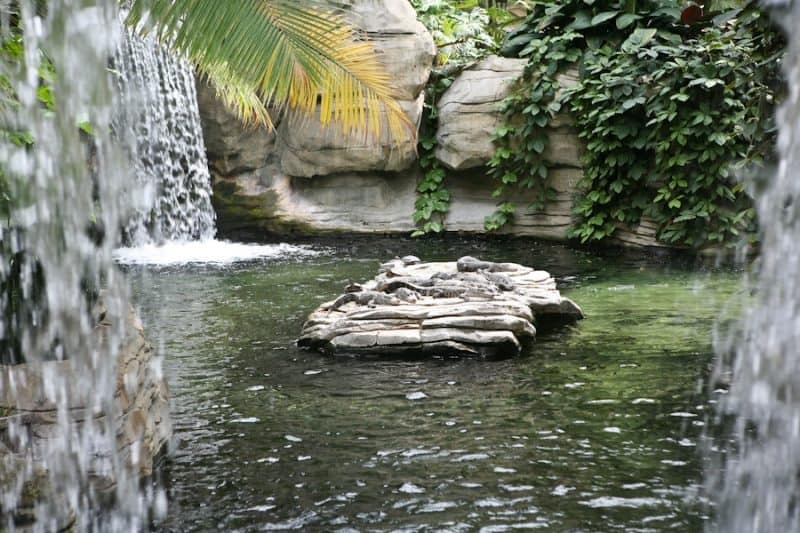 There’s several species of saltwater fish in the water you can see clearly. And to the left of this picture is a copy of the southernmost point in Key West. 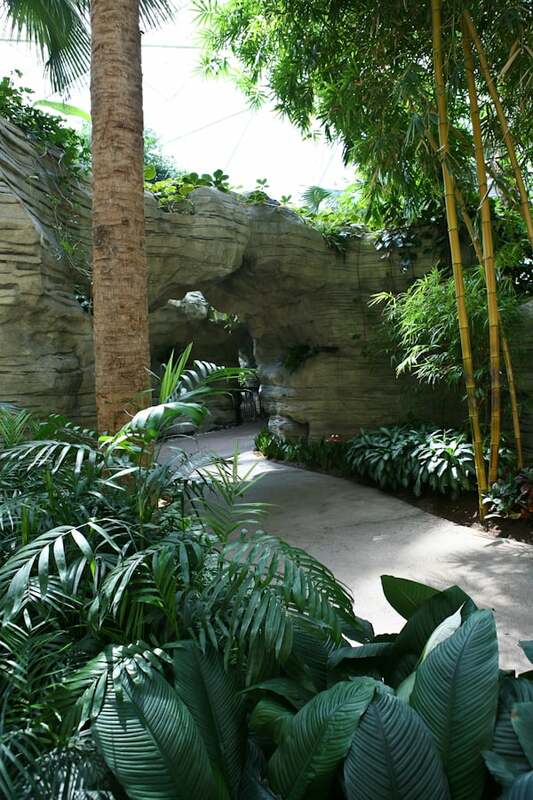 The whole atrium area is built to look like different areas of Florida: Key West, the Everglades and St, Augustine. It’s so pretty. 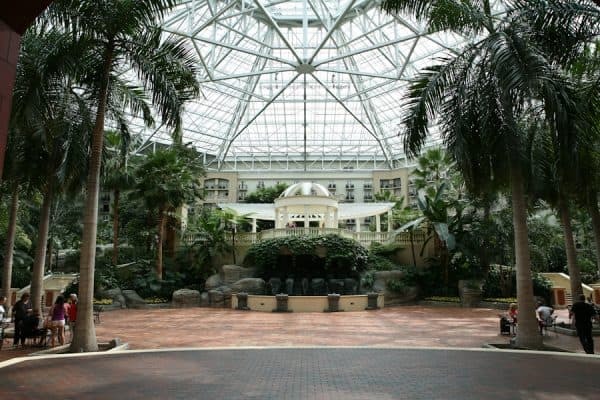 To find out more about The Gaylord Palms in Orlando, their convention center, spa and salon, check out their site here. They have Shrekfeast different times of the year too. Be sure to check out their packages here. Disclaimer: My family and I received the Summer Fun with Shrek & Friends courtesy of Gaylord Palms Resort and Convention Center. All opinions 100% mine. Wow looks like a lot of fun! 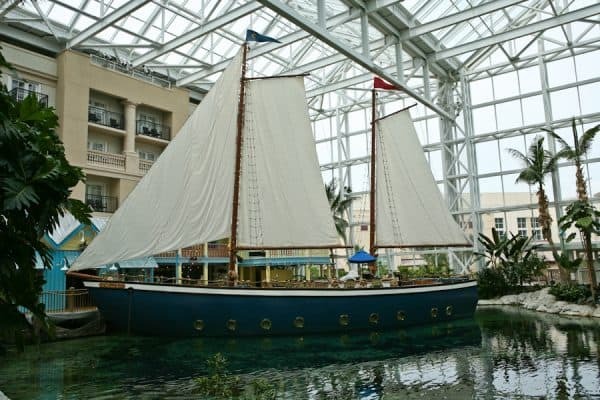 We’ve been to the homeschool convention at Gaylord Palms but have never stayed there. Would love to do that sometime!! Wow! what an awesome event and hotel! We have got to get ourselves over there. My kids would LOVE that (and looks like Julien really did too! What a great trip!